I know you might be thinking that about me or about someone else these days. I know you may look at someone you know in mourning and wonder when they’ll snap out of it. I understand because I use to think that way too. Okay, maybe at the time I was self-aware enough or guilty enough not to think it quite that explicitly, even in my own head. It might have come in the form of a growing impatience toward someone in mourning or a gradual dismissing of their sadness over time or maybe in my intentionally avoiding them as the days passed. It was subtle to be sure, but I can distinctly remember reaching the place where my compassion for grieving friends had reached its capacity—and it was long before they stopped hurting. Back then like most people, my mind was operating under the faulty assumption that grief had some predictable expiration date; a reasonable period of time after which recovery and normalcy would come and the person would return to life as it was before, albeit with some minor adjustments. I thought all these things, until I grieved. I never think these things anymore. Two years ago I remember sitting with a dear friend at a coffee shop table in the aftermath of my father’s sudden passing. In response to my quivering voice and my tear-weary eyes and my obvious shell shock, she assured me that this debilitating sadness; this ironic combination of searing pain and complete numbness was going to give me a layer of compassion for hurting people that I’d never had before. It was an understanding, she said, that I simply couldn’t have had without walking through the Grief Valley. She was right, though I would have gladly acquired this empathy in a million other ways. Since that day I’ve realized that Grief doesn’t just visit you for a horrible, yet temporary holiday. It moves in, puts down roots—and it never leaves. Yes as time passes, eventually the tidal waves subside for longer periods, but they inevitably come crashing in again without notice, when you are least prepared. With no warning they devastate the landscape of your heart all over again, leaving you bruised and breathless and needing to rebuild once more. Grief brings humility as a housewarming gift and doesn’t care whether you want it or not. You are forced to face your inability to do anything but feel it all and fall apart. It’s incredibly difficult in those quiet moments, when you realize so long after the loss that you’re still not the same person you used to be; that this chronic soul injury just won’t heal up. This is tough medicine to take, but more difficult still, is coming to feel quite sure that you’ll never will be that person again. It’s humbling to know you’ve been internally altered: Death has interrupted your plans, served your relationships, and rewritten the script for you. And strangely (or perhaps quite understandably) those acute attacks of despair are the very moments when I feel closest to my father, as if the pain somehow allows me to remove the space and time which separates us and I can press my head against his chest and hear his heartbeat once more. These tragic times are somehow oddly comforting even as they kick you in the gut. And it is this odd healing sadness which I’ll carry for the remainder of my days; that nexus between total devastation and gradual restoration. It is the way your love outlives your loved one. I’ve walked enough of this road to realize that it is my road now. This is not just a momentary detour, it’s the permanent state of affairs. I will have many good days and many moments of gratitude and times of welcome respite, but I’m never getting over this loss. This is the cost of sharing your life with someone worth missing. Two years into my walk in the Valley I’ve resigned myself to the truth that this a lifetime sentence. At the end of my time here on the planet, I will either be reunited with my father in some glorious mystery, or simply reach my last day of mourning his loss. The day I’ll stop grieving—is the day I stop breathing. 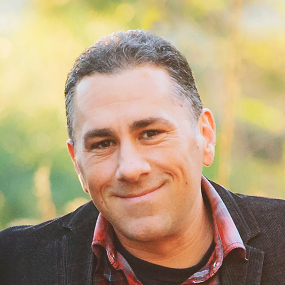 John Pavlovitz is a father of two, (Noah and Selah), and husband of one (Jennifer). He is also a 17-year ministry veteran, specializing in trying to live-out the red letters of Jesus. Read more at John’s website. You can also find him on Facebook HERE. Beautifully written and heartfelt. Sending healing love! Grieving is very personal and takes as long as needed. My wife grieved for years over her brother’s death from leukemia. He was a talented musician, so every time the radio played a song he would play, she would weep. It took years for the tears to stop. The only thing I’ve ever known to be true about grief is that it’s different for everyone, and it behaves very, very oddly indeed. You can have no expectations of it. This is stunningly written though. Enjoyable to read and ponder, even though it’s so sad. Beautifully written and completely truthful. Beautiful truth. It really is a personal journey, and one each of us can only partially comprehend after experiencing a loss and owning the corresponding grief that goes with it. Thank you for sharing. “… the tidal waves come crashing in without notice.” How true. I think I am in a state of numbness after the first avalanche of grief, and then suddenly the waves crash. So you recede further from any thought or memory that may bring the tidal wave on again … and then feel sad that you are distancing yourself from memories and remembering. Thank you, John. I needed to read this, and thank you for sharing this life-changing stage with us all. My mother is dying of metastatic breast cancer and is bedridden. We have Hospice and elder care, and my 91-year old dad is her main caretaker. I am there each day and help as I can. I realize that this stage is “pre-grief” for me. While I enjoy the time I have with Mom now, I am preparing for her death the best way I can, which is listening to her, engaging with her, making her laugh, and just being with her. I feel that my very core will be uprooted forever when she passes on–right now I am focusing on the NOW. I too believe that grief stops only when our own hearts stop. Please know you are in my heart and thoughts. I think about your closing words often. Often, as in seemingly every hour of consciousness, and in far too many hours of troubled dreams. If I have learned nothing else, I know now that breathing is a mechanical function, nothing more, nothing less. Were it not, it would stop the very instant your heart shatters.